It is only relatively recently that the importance of pediatric sleep medicine has begun to be recognized. Articles in the popular media and television programs have started to highlight the importance of sleep and helped elevate it up the public health agenda. In the United Kingdom, for example, there has been a tripling of hospital attendances for children (younger than 14 years) with sleep disorders in the past decade. Certainly, sleep problems can impact negatively on cardiovascular, neurocognitive, and metabolic systems; being associated with a wide range of negative health outcomes such as greater risk of obesity, poor school performance, lack of emotional control, and mental health issues. This special edition of Journal of Pediatric Biochemistry aims to highlight some of the latest literature in pediatric sleep medicine. To know what is abnormal, it is paramount first to understand what is normal. Dr. Miano summarizes normal sleep from infancy to adolescence, describing both subjective and objective parameters including sleep duration and neurophysiological studies on arousal development and sleep spectral analysis studies on sleep and brain maturation. She also discusses how there has been a significant and worldwide decline in sleep duration, and a later bedtime, compared with the past century. Dr. Silvestri and Dr. Aricò explore this theme further in their article on sleep duration and obesity where they critically appraise the literature linking how reduced sleep duration has an almost linear correlation with excessive weight and obesity in childhood, especially in young children. Worryingly, the full impact of the increased use of smartphones and tablets, known to interfere with sleep, may have yet to be seen. Dr. Chawla and Dr. Heussler provide an overview of the common sleep disorders in children, including both obstructive and central sleep-disordered breathing, and nonrespiratory sleep difficulties such as behavioral sleep insomnia of childhood and circadian rhythm disorders. 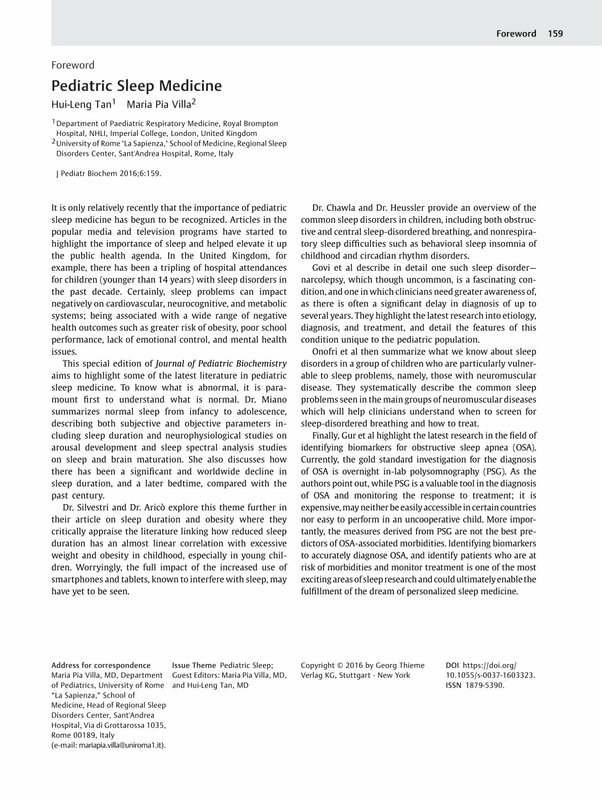 Govi et al describe in detail one such sleep disorder—narcolepsy, which though uncommon, is a fascinating condition, and one in which clinicians need greater awareness of, as there is often a significant delay in diagnosis of up to several years. They highlight the latest research into etiology, diagnosis, and treatment, and detail the features of this condition unique to the pediatric population. Onofri et al then summarize what we know about sleep disorders in a group of children who are particularly vulnerable to sleep problems, namely, those with neuromuscular disease. They systematically describe the common sleep problems seen in the main groups of neuromuscular diseases which will help clinicians understand when to screen for sleep-disordered breathing and how to treat. Finally, Gur et al highlight the latest research in the field of identifying biomarkers for obstructive sleep apnea (OSA). Currently, the gold standard investigation for the diagnosis of OSA is overnight in-lab polysomnography (PSG). As the authors point out, while PSG is a valuable tool in the diagnosis of OSA and monitoring the response to treatment; it is expensive, may neither be easily accessible in certain countries nor easy to perform in an uncooperative child. More importantly, the measures derived from PSG are not the best predictors of OSA-associated morbidities. Identifying biomarkers to accurately diagnose OSA, and identify patients who are at risk of morbidities and monitor treatment is one of the most exciting areas of sleep research and could ultimately enable the fulfillment of the dream of personalized sleep medicine.